Output is available in a number of forms, including plots, tables and reports. You can also export results for analysis in third party tools. 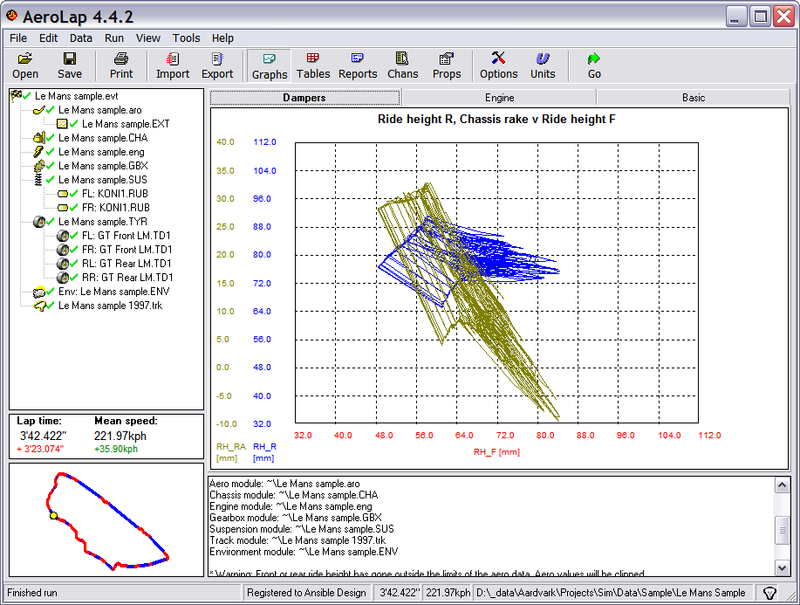 After a simulation you can view the calculated channels as you would view the data acquisition from the car on the built-in Plot display. Plots can be time or distance-based, or scatter plots. Multiple channels can be displayed simultaneously. Manual or auto-scaled channel display min/max values. There is manual or automatic choice of colours. 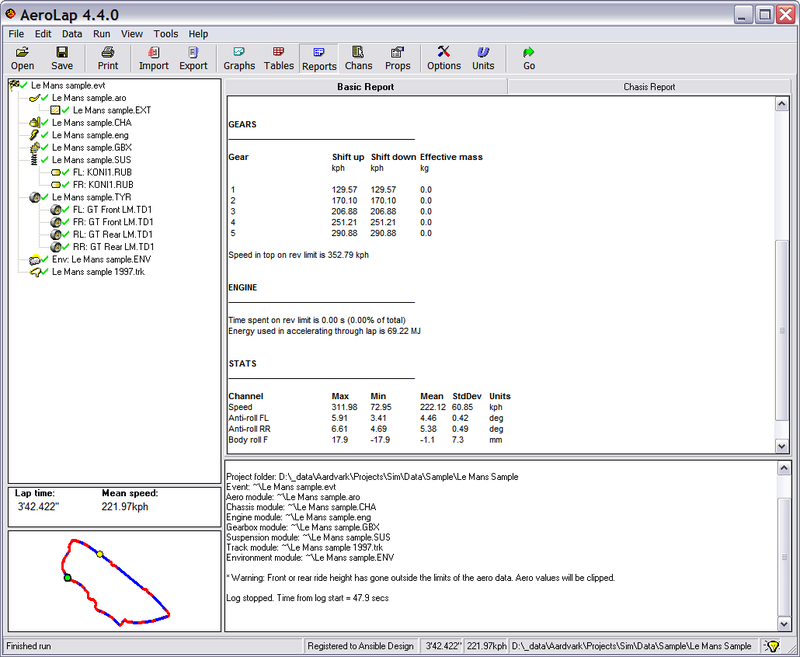 Traces can be overlaid on the results from the last run. 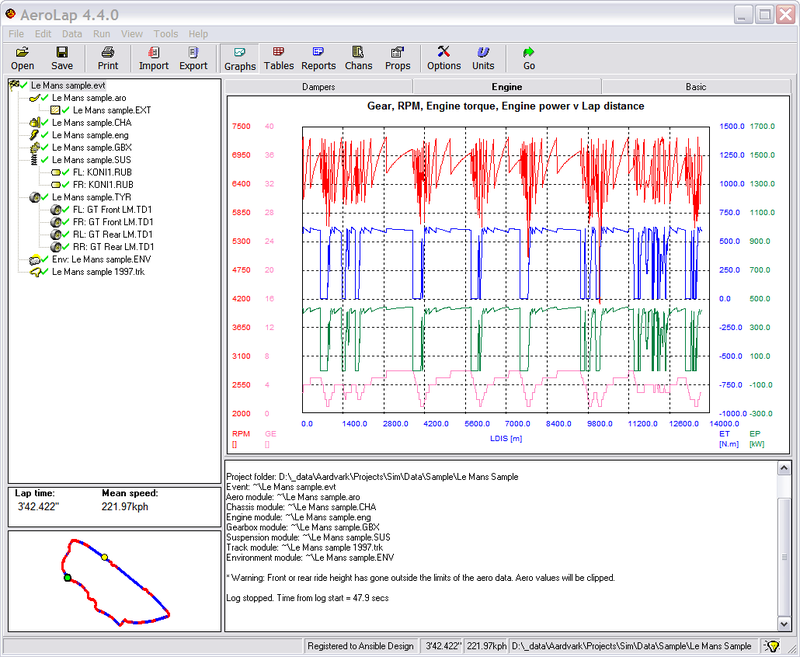 Traces can be overlaid on data imported from the car's data acquisition system - easy to compare simulation with reality. Live cursor read-out for displayed channels. Cursor position in data shown on track map. There is always at least one Graph page, but you can add extra pages, each with different formatting. Each page will be redisplayed whenever you run a simulation. There is a circuit map with a current position cursor indexed to the graph display, so you can see where on the circuit the data belongs to. List of all files used for the simulation. Lap time, average speed, start/finish line speed. Time spent on the rev limiter. 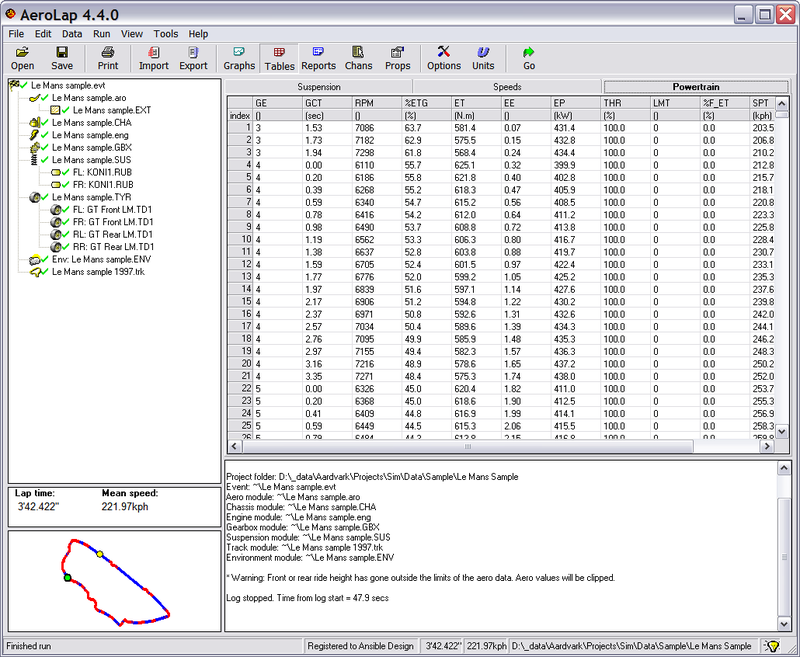 Minimum, maximum, mean and standard deviation over the lap for multiple user-chosen channels. There is always at least one Report page, but you can add extra pages, each with different formatting. Each page will be redisplayed whenever you run a simulation. You can choose up to 40 channels to display in the Table display. Each value is displayed at every point around the track. There is always at least one Table page, but you can add extra pages, each with different formatting. Each page will be redisplayed whenever you run a simulation. Export the channels shown in the current display. Export all channels automatically at the end of each run. The export file format is comma separated text which nearly all third party tools can handle.